This is the last car in my iHWEP/iHWAP with AmitB. 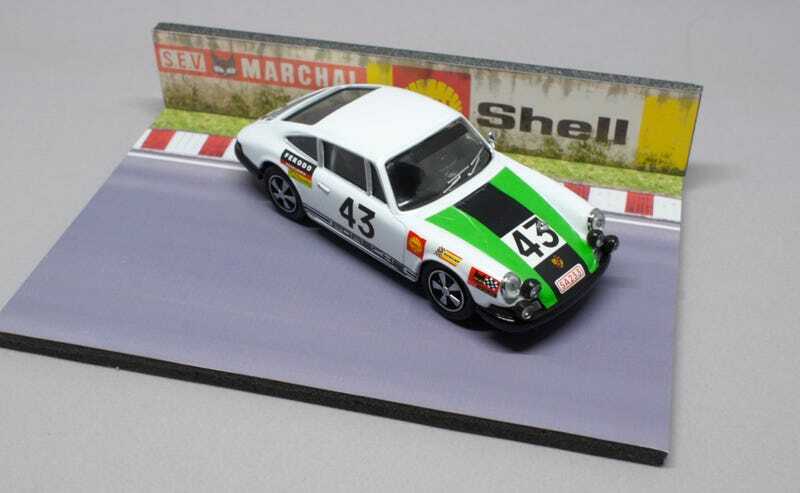 It’s a Vitesse 911T in 1/43. And that “T” wasn’t because it had a Turbo. No. In the early days of the 911 the T was the entry-level 911, with a “T” for Touring. With a 2000cc flat six putting out 110hp. Which was way less than the most sporty 911 of that time, the 911S. Okay, there was a 911R as well but of that lightweight 210 hp beast only 20 were made. So the 911T was clearly the best choice to take it to... Le Mans. Belgians Jean-Pierre Gaban and Roger van der Schrick took this SWB 911 (this one was from before the 911T got it’s 2"- lengthening to give it a somewhat less tricky character in the handling department) to a 12th position in the 1968 24 Stunden von Le Mans. Overall. Impressive if you keep in mind the winner was a Ford GT40 Mk1. Less impressive if you see how many laps less they covered in those 24 hours. A staggering 50 laps. FIFTY! But then again: not many finished at all. 38 Out of 54 started cars didn’t either finish or classify (you had to cover 70% of the distance the winner had covered, two of the most beautiful cars ever -Alpine’s A110- didn’t make it with their tiny 1300cc’s). So one thing it did prove, the reliability of 911's for privateers at Le Mans. A reputation they still have: I don’t think there has been a single edition of Le Mans in which a team of privateers finished in some sort of a 911. And that’s not all it proved as it did win it’s class (GT 2000cc) as well. Some consolation for having Ford’s GT40 winning that year instead of Porsche’s 907 or 908. The model itself is my first Vitesse. It has some flaws but it’s not a new cast so I can easily forgive the green tape being a bit bubbled over the frunk. It comes in a box with a mirror to show both sides of the car at the same time. I thought it’s sponsor decals were a bit oddly positioned. But looking at one of the few pictures from the race it is quite accurate. Just that back could be way more accurate. The 43 is wrongly positioned, there’s a (probably oil-) cap next to the grille and the PORSCHE script is missing. And one aspect really bugged me: The plastic piece underneath the cast which let’s you easily screw/unscrew it from it’s case. It’s 4 wheels won’t even touch the ground at the same time due to it’s height! So das war es from England, diese post schliesst meine Austausch mit AmitB. Almost. Because there was one more thing in the box he send me. But that doesn’t meet the definition of diecast. It is awesome. But it came with a flat tire. Vielen Dank AmitB! I love ‘m all. Tschüss!!! !